Andy Woods' signature modern T in a gorgeous Whiskey Barrel finish. Payments as low as $85/mo. Or, apply & pay as little as $85/mo. We've been waiting on the edge of our seats for this one to get here and man did it live up to expectations and more!! The body design is so tasteful and unique, being able to trace your fingers across the wood grains is a tactile sensation that one rarely gets from a guitar like this. Add to that the incredibly fast modern neck and the traditional pickups configuration and you've got yourself a new best friend. I can't think of another guitar I've played that felt and sounded this good! 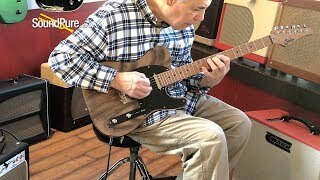 In this video, Sound Pure guitar specialist Eddie Berman is testing out a Suhr Andy Wood Modern T, in a gorgeous Whiskey Barrel finish.